When it comes to popular computer online shops in the United States, Newegg is without doubt very popular. While it attracts users of all experience levels, the layout and design of the store make it ideal for tech-savvy users who know what they want and understand the lingo that is used on the site. If you compare the page of Samsung's new Evo 850 PRo SSD on Newegg with that on Amazon, you will notice that the information on Newegg are more helpful to customers. It displays all specifications for instance as well as links to Samsung's main website and support site which Amazon does not do. While information are nice to have during research, price may play a greater role after all when it comes to a buying decision. Hover Hound is a free extension for the Firefox web browser that adds price comparison and history information to product pages on the Newegg website. 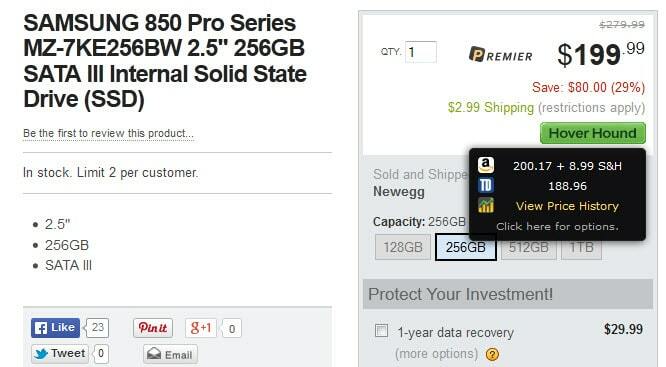 The add-on embeds a new button on Newegg product pages next to the price of the item. The price comparison information that it makes available are automatically expanded on load so that you can compare Newegg's price with the price on other shopping websites right away. Supported right now are Amazon and TigerDirect. A click loads the product page on the selected shopping site in a new tab in the browser. You can also click on the Hover Hound button directly to be taken to the primary store that is defined in the options. Hover Hound works on search result pages on Newegg as well. Here you will see buttons added to each result so that you can compare prices quickly before you make a buying decision. Another interesting feature of the add-on is that it will display process benchmarks when you are searching for cpus on the site. This is not working for all processors but for those that it is working, you can compare the benchmark performance of the selected processor with another one. As far as the pricing history is concerned, it is pretty straightforward. You need to click on the view price history link listed by the extension to display a graph as an overlay on the screen that highlights how prices hafve developed in the past two months. The graph lists the price on all three supported shopping sites with options to disable one or two of them to remove noise from it. The options page makes available other features that you may find useful. Here it is possible to limit products on Amazon to those supporting Amazon Prime, and to add tax to Amazon as well. Other options include disabling the automatic price check on Newegg, and disabling select features such as the price history or cpu comparison. If you shop regularly on Newegg or use it for research, you may find the Hover Hound extension useful as it provides you with additional information. 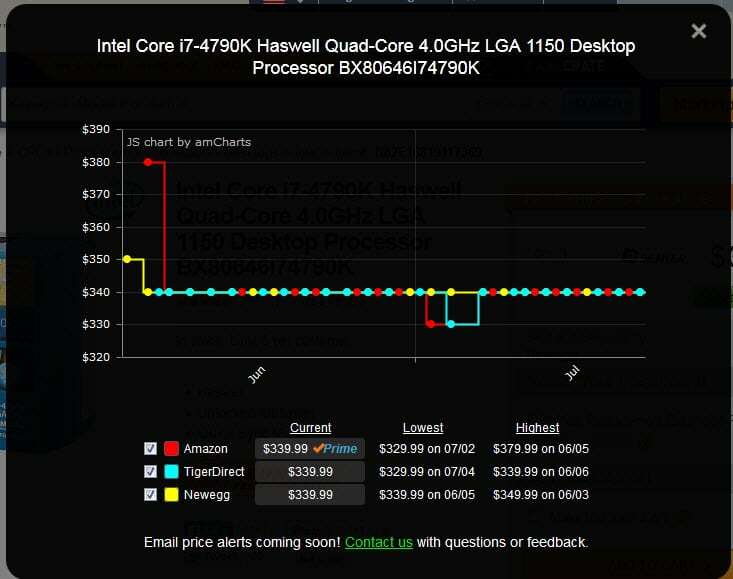 Its combination of price comparison and history, and soon to come price change alerts, will certainly appeal to users who use Newegg at least occasionally. Well this is amusing, an extension that acts much like the hidden forced on us sales malware and they are making it optional. Between the two giants NewEgg and TigerDirect… site layout wise I actually prefer TigerDirect. There is more product info per item there then on NewEgg. Often I found NewEgg info lacking or dead wrong, but luckily they often post the manufacturer homepage link. It is rare it is a direct link. I’m not saying I’ve never found mistakes on TigerDirect but I’ve found less compared to NewEgg. Overall TigerDirect’s standard information layout is easier to read, contains more information and has an eight item compare feature. 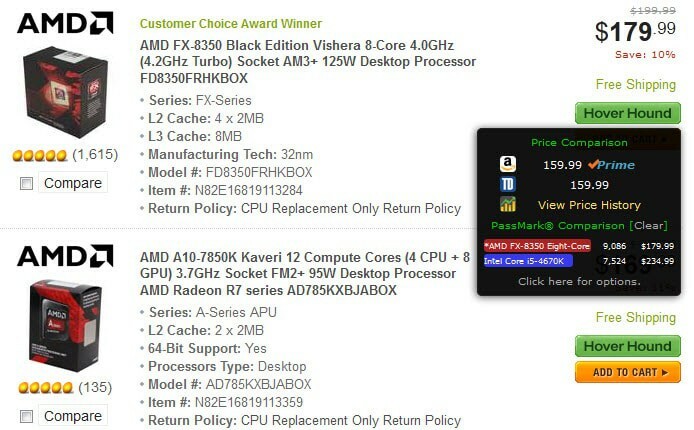 NewEgg’s compare feature only holds five items. TigerDirect lists the package size as well as shipping weight, NewEgg does not. TigerDirect tends to carry a limited or only popular brands, while NewEgg carries a lot of brand names popular or not. The cost of shipping the items from USA to Canada is 25% to 65% lower in shipping cost compared to TigerDirect. TigerDirect to Canada uses Puralator, while NewEgg to Canada uses UPS. Overall I find NewEgg prices and shipping prices much lower than TigerDirect who often lists the shipping weight based on the value of the item rather than the actual weight. Bottom line sometimes the prices are better on TigerDirect than on NewEgg, but after the shipping cost is tacked on, often NewEgg’s overall price is cheaper so I go with NewEgg. I only go with TigerDirect is when I need that exact item which isn’t carried by NewEgg.